I did tell you that I have been in a muffin mood lately. 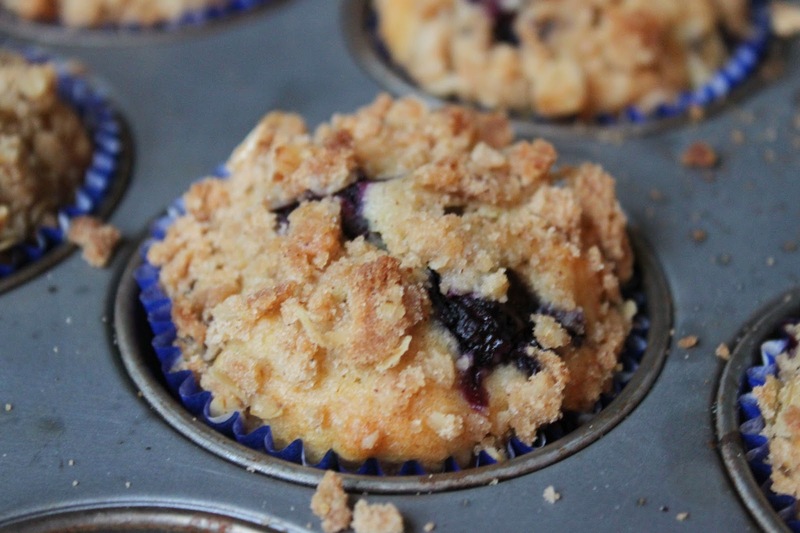 Blueberry muffins have always been my favorite muffin. I rarely stray from my typical recipe (since it is so delicious), but thought I would try to make a version with some oats. I was quite pleased with this version and they make the perfect quick breakfast when you have to nurse a baby and take care of a toddler. I realize that most of you aren't in the same situation as me, so these are also great for a quick breakfast on your way to work or for a slow breakfast when you want to sit and enjoy. I individually wrapped each muffin in plastic wrap and froze them in a freezer bag. All you have to do is unwrap and microwave 30 seconds for perfection. Preheat oven to 400 degrees Fahrenheit. Line a 12 cup muffin pan with paper liners. In a small bowl mix the oats and orange juice together and set aside. To make the topping, mix the brown sugar, oats, four, and cinnamon in a bowl. Add butter using either a fork, pastry cutter, or your fingers until you have a crumb. Set aside. In a medium bowl, mix the flour, sugar, baking power, salt, baking soda, and cinnamon. Using a whisk, blend in the oil, vanilla, and egg. Gently stir in the oar mixture and fold in the blueberries. Spoon batter into the prepared muffin cups. Top each muffin with crumble topping. Bake 18 - 20 minutes until lightly golden and a knife inserted in the center of a muffin comes out clean.